DAVE HAZARD 4th Dan. Interview By John Cheetham. INJURIES CLINIC: THE KNEE & LOWER BACK. By Chris Norris. FREE-FIGHTING COACHING. The Basic Principles. By Malcolm Phipps. SHOTOKANíS WILLIE THOMAS Wins European Title. Seishinkai Report. SENSEI KASE 8th Dan JKA. Interview By Gerry Grey. THE 9TH SHIRO ASANO TEAM CHAMPIONSHIPS. Report By Boz Tedder. TERRY O'NIELL COURSE. Report By John Cheetham. 'ALL CHANGE' as you can see the magazine is now size A4 which I hope all our readers like. I liked the smaller size (A5) but everyone has been asking me to change to the A4 like Combat and Fighting Arts magazine. People feel better with a magazine this size, or so I'm told. I thought it was the content that counts most, not the look. Still, I've bowed to the pressure and here we are with issue No. 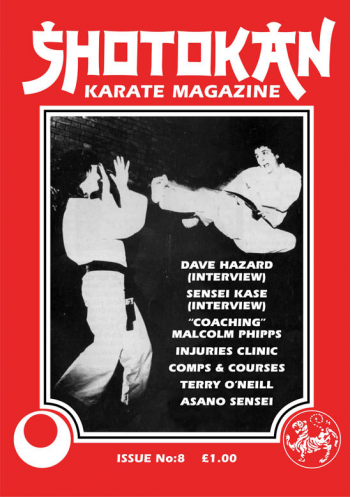 8 featuring two good interviews with Dave Hazard and Sensei Kase, the latter being kindly donated by Gerry Grey, the K.U.G.B. Press Officer. I still get some letters saying that the magazine is biased towards Shotokan Karate. Of course it is; only I wouldn't use the word biased, it just happens to be for... 'US WHAT PRACTICE SHOTOKAN' DUN IT!! You all know about Shotokan Karate... 'Boring long stances, Discipline, stiff as boards, only move in a straight line, can't kick, too tense, too traditional, closed minds, etc., etc. I can't think why so many people practice 'boring old Shotokan'!!! There are some great summer courses going on again this year and I certainly advise students to give this type of training a try. An awful lot of knowledge and ideas can be gained from such an intensive study. Most, in fact I think 'ALL' of the courses are open to students from any of the many Shotokan organisations and you will be made very welcome. 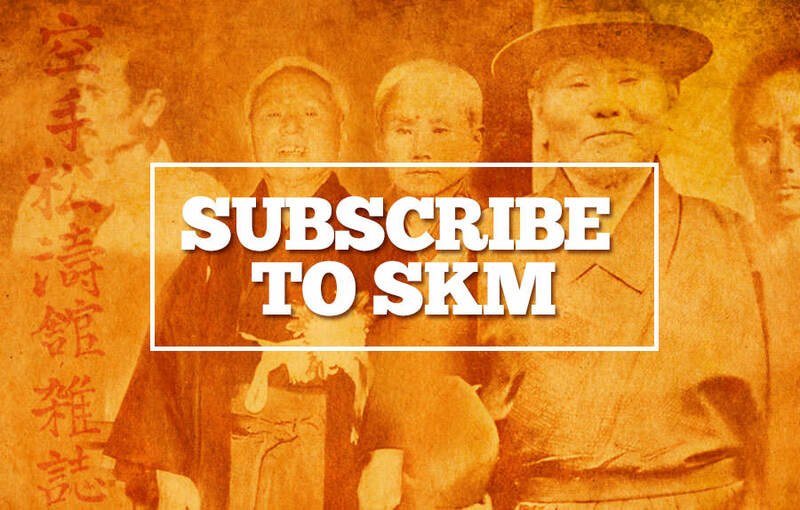 August is a good month with the S.K.I. course in Nottingham with Sensei Asano 7th Dan and the K.U.G.B. course at Lancaster with all the senior K.U.G.B. instructors, senseis Sherry, O'Niell, Poynton etc. In September at Crystal Palace, London, there is a weeks course with senseis Enoeda, Kase, Shirai, Kawasoe, all senior J.K.A. instructors.